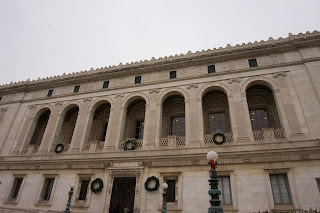 Last year, I stumbled upon the Detroit's Main Branch of the Public Library. 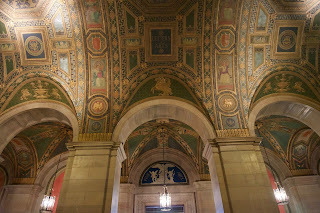 Like some of my previous experiences in Detroit, it was this amazingly beautiful building that I hadn't read about and went into out of curiosity, and was virtually empty when I went in. It felt like a major discovery. 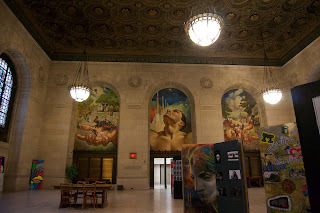 Detroit Public Library, Main Branch, entrance on Woodward Ave, September 12, 2015. Upstairs at the Detroit Public Library, Main Branch, December 12, 2015. You can see, beyond the door, large murals, in three panels. There's also a temporary art exhibit in front of it. Last year, when I visited, this room was empty. Damn you, Detroit, for making good use of your public spaces and attracting users of it!!! This room is dominated by three murals by Canadian, John S. Coppin, called "Man's Mobility." The murals are oil on canvas and were glued in place in 1965. Detroit Public Library, December 12, 2015. Using my panorama setting on the camera, giving this weird effect, showing the mural and the wall on the right. Another view of "Man's Nobility," showing its size. This room was empty when I visited last year, giving me the feeling I had stumbled on a secret. Now I have to share it. Sigh. December 12, 2015. The murals are meant to show modes of transportation developed by "man." 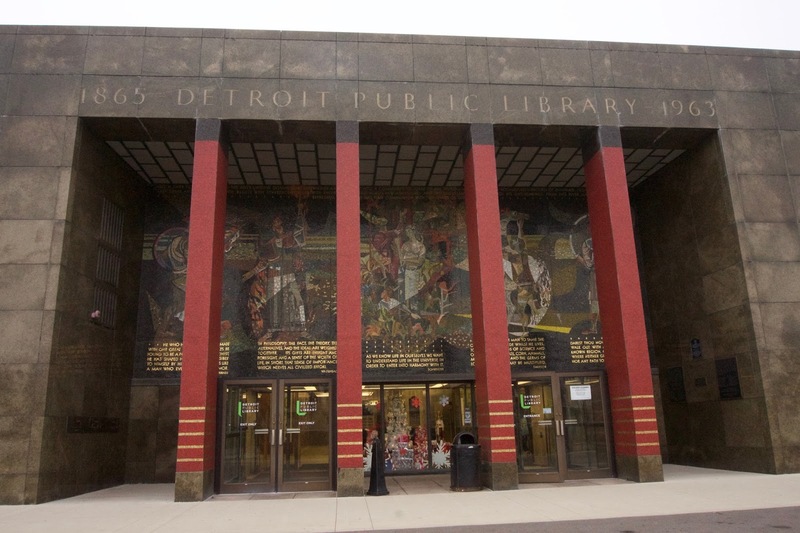 Centre panel of "Man's Mobility," Detroit Public Library, Main Branch. 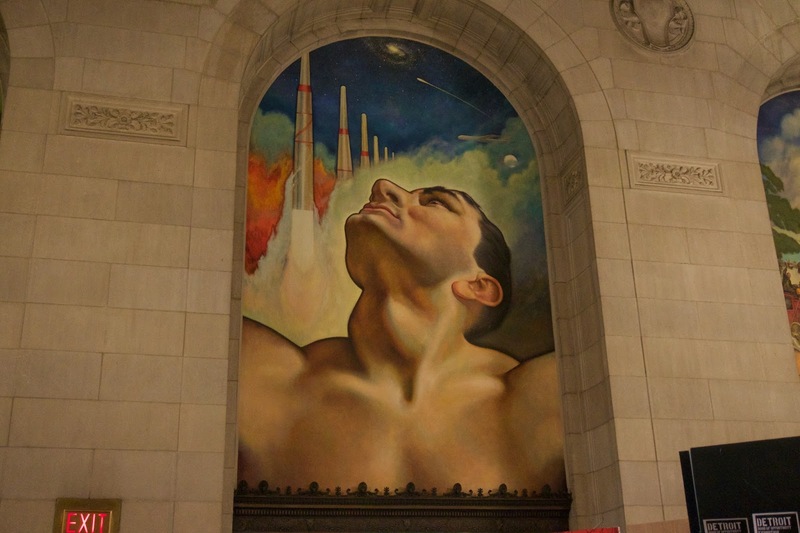 Depicted behind the man's head are some rockets, and a transcontinental airliner to the right. December 12, 2015. 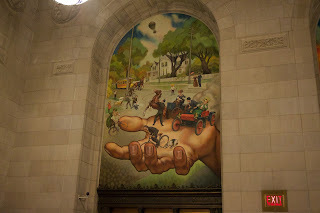 Detail of the left panel of "Man's Mobility," Detroit Public Library, Main Branch. December 12, 2015. Depicted are a bicycle, trolley, hot air balloon as well as an early Oldsmobile. I'm too lazy to post a picture of the hand on the right (viewer's right) not the man's right hand. 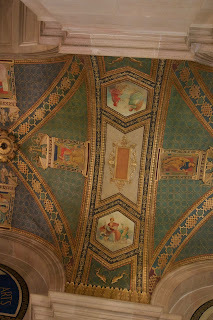 Plus I was distracted by the ceiling outside the room containing the murals. The ceiling outside the room housing "Man's Mobility." 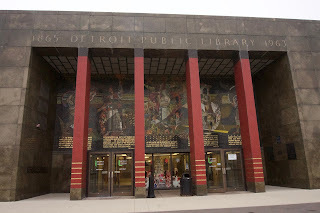 Detroit Public Library, Main Branch. December 12, 2015. 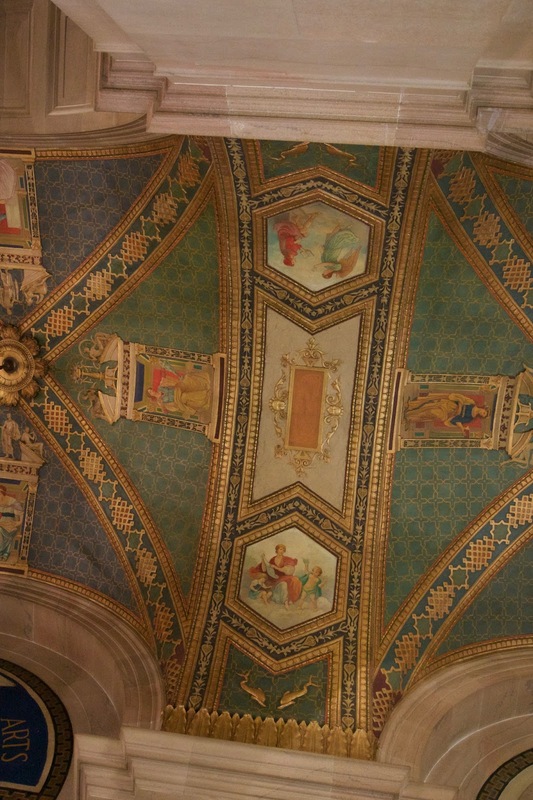 Ceiling of an arch. Detroit Public Library, Main Branch. December 12, 2015. There was an addition to the Main Branch, constructed in 1963, that added another entrance. 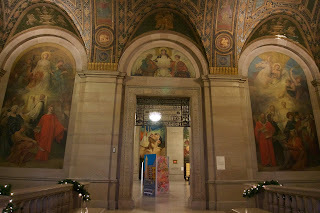 Entrance to the Detroit Public Library, Main Branch, Cass Ave., December 12, 2015. The mosaic is rather pretty. Don't you think? 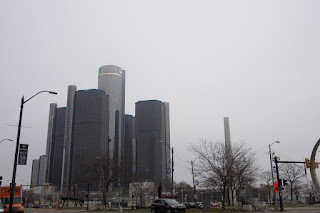 Later, I fulfilled a childhood dream of staying at the Renaissance Center. It used to the tallest hotel in the world, when I was a kid, and 8-year old Teza used to see pictures of this building and say, "One day, I'll stay there!" If I could only go back to 8-year old Teza and say, "One day, kid, you'll be living the dream." More on that later, but here's a pic of the Renaissance Center.